Pine nuts are expensive. | I made that! Construction on my new business, The Pantry, is moving along, and I can finally see how the space is going to feel when all done. Such a good feeling. Then we released our class schedule on Monday and my “How to be a Pie Ninja” classes sold out in three days! And THEN, as if that wasn’t enough to make me blush, I wake up on Wednesday to the announcement that “I Made That” is a finalist for Saveur Magazine’s Best Cooking Blog award along with 101 Cookbooks, Lottie and Doof, Smitten Kitchen, Sprouted Kitchen and The Wednesday Chef! Seriously, my friends, I am glowing. And a little intimidated…I mean, I knew I had a few readers out there, but I don’t know how I landed in that company. All of a sudden I’m staring intensely at my photos, worried that they just aren’t up to snuff. And what recipe do you post when people are actually LOOKING? I was so scared I actually went out and bought $25 worth of pine nuts, because suddenly walnuts just weren’t good enough! I’m cracking people, I obviously can’t take the pressure. But thank you, whoever nominated me, you are a very nice person. And I mean that. And folded them into one of the weirdest cake batters I’ve ever made. It’s from the book “Urban Italian” by Andrew Carmellini, which is a book that I just love. Everything I’ve made from it has been right up my alley, and I’m excited to share this particular recipe. The book has you start with creaming the butter and sugar, and then go straight into adding all of the flour. Once all the flour is in, THEN you start adding the eggs, yogurt and lemon juice. That’s just crazy. But it worked. The cake has a beautiful crumb and it’s not too dense for my taste at all (did I mention it gets meringue folded into it? That probably has something to do with it). 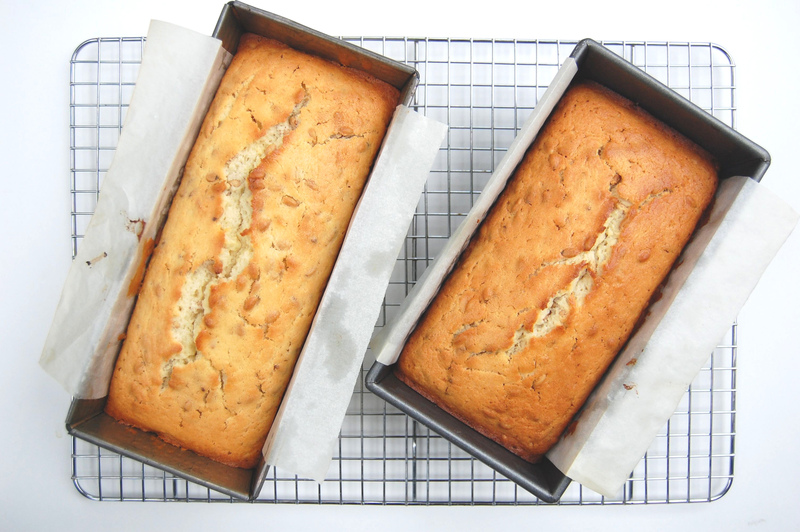 It’s a simple cake, with the texture of a pound cake and a flavor that is almost savory. I made the recipe as he called for, except that I added salt, because all cakes want a little salt. And to be honest, I might add a bit more next time to make it feel even more savory. Or maybe make a salty caramel to pour over it. In fact I might just go do that right now. Certainly all that salt I just added makes it count as dinner rather than dessert, right? – Meanwhile, cream the sugar, butter and lemon zest together in a KitchenAid with the paddle attachment. Be sure to scrape down the sides as you go to make sure everything mixes evenly. – When the mixture is quite smooth, add the flour and baking powder. Mix until the dry ingredients are just incorporated and then begin adding the eggs, one by one, waiting until each egg is thoroughly mixed in before adding the next. Turn the KitchenAid up to high for about 5 seconds to combine everything thoroughly, then scrape down the sides and the bottom with a spatula and mix in any bits that have failed to incorporate. – Add the yogurt and mix in with the paddle attachment until it’s thoroughly incorporated. – As you continue mixing, add the lemon juice and incorporate. Scrape down the sides and bottom and mix well with a spatula. Then transfer the mixture to a large bowl. – Fold a third of the meringue into the batter using a rubber spatula to combine well. Add the rest of the meringue and fold in well until the mixture is combined. 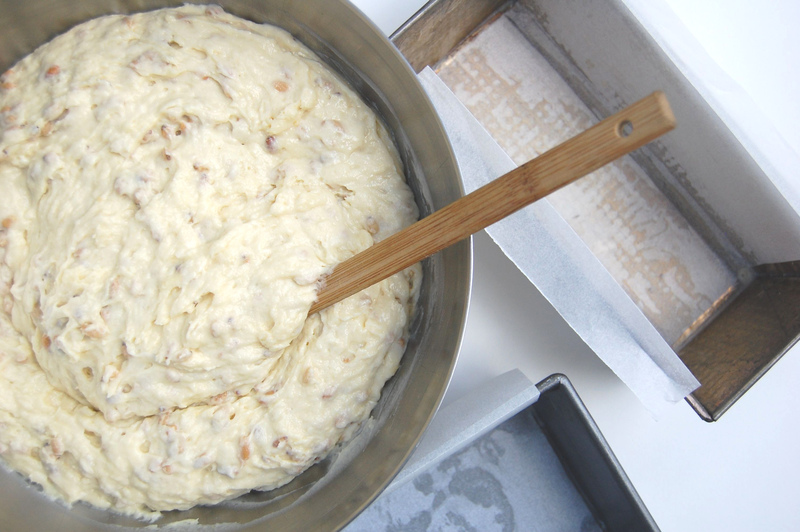 Fold in the pine nuts, reserving about 3 tablespoons for the top of the cakes. – Bake the loaves on the middle rack until you can put a knife into each and bring it out clean, about 45 minutes. – Remove the cakes from the oven and let cool in the pans for about 30 minutes and then turn them out onto a cake rack to cool completely. « Homemade Doughnuts! Krispy Kreme style! You SO deserve the nomination! You have a wonderful blog. Yes, the company your with is amazing, but so are you! First of all, congrats! I know I have been enjoying your website. Also, I took a look at your list of classes and am now a little jealous of all those who live close enough to attend. Enjoy the praise, it is well deserved. Sounds unusual and delicious. I just made homemade donuts, and now I must make your Krispy Kreme version. Love your blog. That is so fantastic that you were nominated for Saveur. How exciting! I discovered your blog recently, have made a handful of recipes already, and everything has been fantastic. Most definitely the nomination was well-deserved! Congratulations. I’m not a big blog person and I love your blog! I read every post. Congrats on the nomination! I was so pumped to have found your blog … you have a wealth of amazing recipes! “Weird cakes” are right up my alley too … especially when there is talk about adding salted caramel to them. Can’t wait to try this! Congratulations! Your blog is amazing, and oh how I WISH I was anywhere near Seattle! Your new business venture sounds so fun, so exciting — just the kind of thing I’d love to do if I had any business sense! And I’m with A Plum by Any Other Name; “weird cakes” rock. Ww know it’s an honor to just be nominated, but we like you best. Are you kidding? Of course you’re in THAT company! I only recently started reading your blog, but it’s easily my favorite, and I told Saveur so by voting for you. Yours is the only blog that consistently makes me both drool and laugh. Thanks for cooking and writing! Love the idea of a pie ninja class! And many congratulations on the nomination. Cheers! I just came across this morning and I am loving it! The nomination is very well deserved – Congratulations!! Awesome Brandi! Congratulations!! Miss hanging out with you cats. Ohh and yes Pine Nuts are expensive!! Worth it through. See you soon. I came across your blog several months ago. And I have been a regular visitor since. This is a great blog…because it is a reflection of you. As a culinary professional, I love your approach to what you do…it’s great. That’s great about the nomination! I also made a weird cake batter recently from the Chocolate Bar cookbook: first you melted the butter and whisked it in with some oil, and then seized it using more than a cup of ice water–it made the butter really smooth and light. Then it called for sifting all the flour and sugars and everything else dry together, and adding it all at once, following that with the eggs mixed with some sour cream. The cake is incredible! It’s funny how when you get used to a basic formula you can get thrown for a loop when something unique comes up! Pine nuts are one of the few nuts that we can keep in the house due to Mr’s allergies. These cakes look phenomenal! Congratulations, now my frequent checking for new posts is validated.. I’m excited about your new business too… good luck and have fun in the process. It’s only occasionally scary, right? Yes you are totally awesome. Nutter Butters… you deserve it. I deserve the cake. This reminds me of a long ago ex-boyfriend who, when buying pine nuts, would write the bulk bin code of something cheaper (i.e. sunflower seeds – or whatever looks close) on the tag instead of the expensive pine nut code. Needless to say, he didn’t turn out to be a trustworthy one. pine nuts ARE expensive! I had to comment, because years ago I toasted them by sticking them in the oven under the broiler, promptly forgot about then & then they were ON FIRE. Anyways, my new boyfriend (now husband) put the fire out……and since then no pine nuts. Just didn’t seem worth it & have relied on other nuts. Your post has inspired me to maybe buy some again. Firstly congratulations on your nomination. You provide an absolutely wonderful blog that I love reading all the way from Australia. What a service you offer your fellow food creators. Secondly I checked out the websites for Delancey and the Pantry and loved them. I was wandering whether you have ever posted a recipe for your Meyer lemon budino? Is it like a panna cota? A quick search lead me to epicyclic website and what looks like a spongey pudding like what we call a lemon delicious (a sort of self saucing pudding). I’m curious to find out. I voted for you! I read most of the other nominees’ blogs and adore them. What I think is special about your blog is that you challenge the reader a bit more, while still keeping it fun. I like that you write about technique without assuming that the reader doesn’t know anything. There are so many recipes on your blog that I’d like to try when I have the time! I made the most incredible pine nut butter cake once, it was delicious and so worth the pine nut expense! This one sounds similar. Congrats on the nomination too! Congratulations on the nomination – so exciting! These cakes looks delicious, did you add the salted caramel? This is the kind of dessert that I have a weakness for. And congrats to you, Brandi! All of your accolades are well-deserved. I really and truly want to make it up to Seattle this summer to visit The Pantry. Wow congratulations on the nomination! Love the idea of pinenuts in a cake…definitely dessert for dinner! Divine. Oh, how divine. The more expensive a meal, the richer the taste. Congratulations, a bunch of times over on the nomination. It’s so deserved. And yowza, yes, pine nuts are pricey – but yum, that’s a good looking cake. I’m wholeheartedly behind the salted caramel addition. Hi there and congratulations on being nominated by Saveur! That is how I found your refreshing blog. Good luck! I really like Carmellini’s book, too. Have you tried the eggplant aguadulce? It is amazing. i just bought this cookbook and have to say that i LOVE it! i enjoyed it especially after reading the foreword; andrew carmellini is such a down to earth and laid back guy, and that shows through in the most beautiful way in his recipes. i havent made anything yet, but have a ton of recipes with their ears dogged down! 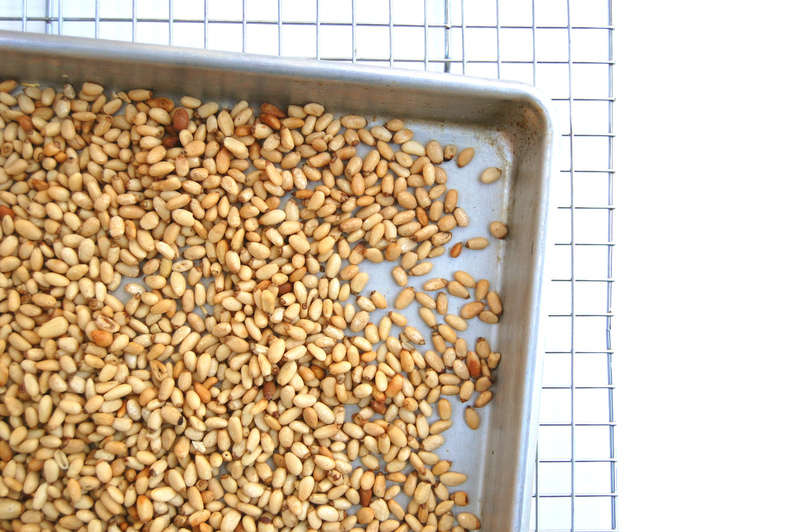 and yesh….pinenuts….i live in NYC and the tiniest containers of them are $10! i cave way too often but really….thats just insanity! So funny how we worry after the fact: you were honored for being just exactly who you are NOW, silly girl. No need to *try* to come up to snuff, because : news flash : you’re already there according to Saveur! So enjoy, and keep on keepin’ on. But… I was so hoping to see a slice of cake all studded with those pinenuts – you know – the money shot, right? The post still made my mouth water though, so, you’re good. Found you via your nomination! Great site!! I just stumbled on your blog (thanks to a link from the Kitchn) and really like the site a lot; what a great find! However, in seeing this recipe, my eyes popped out of my head a bit. As someone who has suffered from “Pine Mouth” (as described by another poster above, and in all the research I did after realizing what it was), please include this warning with any recipe that includes pine nuts: do not buy any imported pine nuts from China, which includes most containers at your typical super market. For two weeks, I was left a taste in my mouth that I imagine to be similar to battery acid, and eating any other food, and especially drinking water, made the taste even worse. It was awful. In doing research, the FDA believes this recent phenomenon to be attributed to China’s passing off non-edible nuts as pine nuts; they are also seeking domestic growers to stop importing pine nuts from China altogether. While my case lasted two weeks, I found that some people afflicted with Pine Mouth had the bitter taste for up to four and five weeks. Yikes! I found pine nuts at costco and they are still expensive but more of a bang for your buck! I can hardly wait to tryout your recipe for Pine Nut Cake. I never heard of such a cake until being referred to in,”Death of a Red Heroine” by Qiu Xiaolong.